BEGINNING A NORMALLY UNEVENTFUL journey home by train, insurance salesman Michael MacCauley (Liam Neeson: Taken) is about to find that a distressing day where he has lost his job, is about to get worse. Unsure how to tell his wife Karen (Elizabeth McGovern) about his unexpected unemployment, Michael boards the train only to find his wallet and phone was stolen in the station. Unaware of the frightening events that are about to occur, he catches up with fellow commuters Walt (Jonathan Banks: television's Breaking Bad) and Tony (Andy Nyman) and considers how he can manage to pay the college fees of his son Danny (Dean-Charles Chapman). To his surprise, he is approached by mysterious stranger Joanna (Vera Farmiga: The Conjuring; The Departed), who has a seemingly-attractive proposition for him. Joanna knows who he is and offers him an opportunity to solve his looming financial problems. For one hundred thousand dollars, she says, all he has to do is to identify an unknown passenger before the train reaches the last stop; but he is given no further information other than that the person will be carrying a bag and using a particular name. At first tempted, Michael quickly comes to realise that the deal will involve him in a dreadful crime as his subsequent reluctance to fulfil the bargain is met with threats to his family and a horrific show of the violent lengths the people behind Joanna will go to in order to force him to comply  they appear to have eyes everywhere and Michael is unsure of whom he can trust. Given no choice other than to be seen to be following their demands, Michael must use his skills as a former police detective to uncover the mystery while dealing with unexpected twists and turns or face the deadly consequences that await him, his family and his fellow passengers. As he races against time, Michael is feeling the backlash of the deadly plot that will see him caught up a frantic life-and-death struggle in this engrossing mystery conspiracy with powerful action sequences. 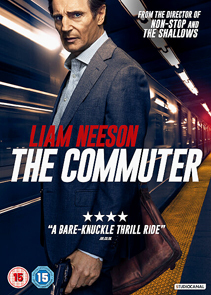 A tense and exciting action thriller with amazing effects, The Commuter is the perfect vehicle for the formidable action sensation that is Liam Neeson! Liam Neeson and Director Jaume Collet-Serra team up once again after working together on Run All Night and Non-Stop. The Commuter also features: Sam Neill (Jurassic Park series) as Captain Hawthorne; Patrick Wilson (television's Fargo) as Lt Alex "Murph" Murphy; Killian Scott as Dylan; Clara Lago as Eva; Roland Moller as Jackson; Ella-Rae Smith as Sofia; and BAFTA 2018 Rising Star nominee Florence Pugh (Lady MacBeth) as Gwen. Music is by Roque Banos; Director of Photography is Paul Cameron ASC; Story is by Byron Willinger & Philip de Blasi; Screenplay is by Byron Willinger & Philip de Blasi and Ryan Engle; Executive Producers are Juan Sola, Jaume Collet-Serra, Ron Halpern and Didier Luper; Produced by Andrew Rona, pga and Alex Heineman, pga; and Directed by Jaume Collet-Serra (The Shallows). Described as "exceptionally entertaining", The Commuter is available on Digital Download from 14 May 208 and on DVD, Blu-ray and 4K Ultra HD in the UK on 21 May 2018. Certificate: 15 | Running Time: 104 Minutes Approximately. Extras: Liam Neeson Interview | Making of Featurette.